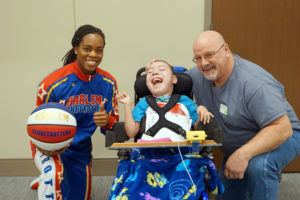 A member of the world-famous Harlem Globetrotters visited The Children’s Center Rehabilitation Hospital today. The team will be in town for their show at the Chesapeake Arena scheduled in early February. Lili “The Champ” Thompson was a member of the wildly popular Notre Dame Women’s Basketball Team who won the national championship in 2018. She was later drafted to become a member of the Harlem Globetrotters. Lili met with patients during a fun, interactive performance at the Hospital while in Oklahoma City promoting their show on February 9th. Lili said the experience was awesome, and she enjoyed the warm welcome. “We had a lot of Globetrotter fans in the room. We had a lot of people participate and learn some tricks. That’s the most fun part,” said Thompson. 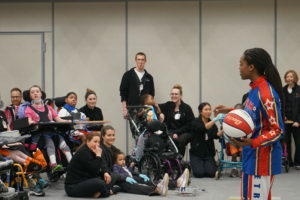 This is the fourth year a member of the Globetrotters has visited the Hospital. The Harlem Globetrotters Smile Patrol visits over 200 children’s hospitals worldwide each year.